What Happens to a Debt After Seven Years? Seven years is a well-known time limit when it comes to debt. It's referred to so often that many people have forgotten what really happens to debt after seven years. Seven years is the length of time that many negative items can be listed on your credit report. This includes things like late payments, debt collections, charged-off accounts, and Chapter 13 bankruptcy. 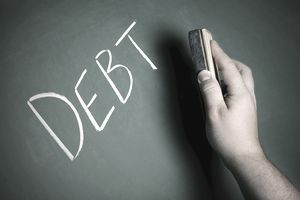 Certain other negative items, like some judgments, unpaid tax liens, and Chapter 7 bankruptcy, can remain on your credit report for more than seven years. After seven years, most negative items will simply fall off your credit report. Your credit report, if you're not familiar, is a document that lists your credit and loan accounts and payment histories with various banks and other financial institutions. The seven-year mark does not erase the actual debt, particularly if it's unpaid. You still owe your creditor even when the debt is no longer listed on your credit report. Creditors, lenders, and debt collectors can still use the proper legal channels to collect the debt from you. That includes calling you, sending letters, or garnishing your wages if the court has given permission. You can even be sued for a debt if your state’s statute of limitations for that debt is more than seven years. Even though debts still exist after seven years, having them fall off your credit report can be beneficial to your credit score. Once negative items fall off your credit report, you have a better chance at getting an excellent credit score, granted you pay all your bills on time, manage newer debt, and don’t have any new slipups. Note that only negative information disappears from your credit report after seven years. Open positive accounts will stay on your credit report indefinitely. Accounts closed in good standing will stay on your credit report based on the credit bureaus' policy. When the negative items fall off your credit report, it also improves your chances of getting approved for new credit cards and loans, assuming there's no other negative information on your credit report. Does the Seven-Year Period Ever Start Over? Many people are afraid of paying a past due balance because they believe it will restart the credit reporting time limit. The good news is that the seven-year time period for negative information does not start over, even after you bring your account current or pay off the balance. For example, say you were 60 days late on a credit card payment in December 2010. This late payment should have fallen off your credit report in December 2017. Let's also say that you caught up on your payments and made all payments on time until August 2013 when you became 90 days past due and then caught up again. Your previous late payments from December 2010, will still have fallen off in 2017. The late payment from August 2013 should fall off your credit report in August 2020. The account itself will stay on your credit report if it remains open and in good standing. Check your credit report to learn when negative items are scheduled to be deleted from your credit report. When the seven years is up, the credit bureaus should automatically delete outdated information without any action from you. However, if there's a negative entry on your credit report and it's older than seven years, you can dispute the information with the credit bureau to have it deleted from your credit report.